I must preface that I am the biggest advocates of golf lessons and golf coaches that you will meet. Think about it any sport you’ve played, baseball, football, hockey, tennis, and for you women, even cheeleading teams have a coach. However, many golfers do not have a coach to guide them. Unfortunately, the process of lessons can be a bit intimidating, expensive, requires time and comes with no guarantees. What if I told you that you can take a golf lesson online, without the intimidation and from the comfort of your own home? You can finally choose from a list of reputable instructors without any geographic restrictions. Well, now you have an alternative. Mobiplex, the maker of the SwingTIP , a pocket sized golf swing analyzer now brings you Mobicoach, an application designed specifically for online golf lessons. In this episode I interview David Grove from Mobicoach who tells about how and why the way we take golf lessons is changing. 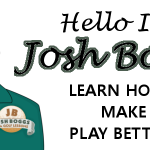 He’ll explain how Mobicoach can revolutionize your golf game. Tune in to learn more about how amazing and convenient this technology is and learn why you should be using it. If you’re not tech savvy, don’t worry, the Mobicoach setup is a breeze. Simply download the FREE Mobicoach app on your iPad2+, iPad Mini or iPad Air from the App Store and create a customer profile to get started. During your lesson, talk and see your instructor though live audio and video streaming. Your instructor can automatically capture videos on your iPad and share their own captured videos with you for enhanced instruction. Watch while your instructor dissects your video in real time using the Mobicoach white-boarding tools. Our display mirroring technology lets you see what the coach is doing while they do it. Get instruction you can implement on your next swing. Don’t worry if you can’t remember all the tips your coach gave you. After your Mobicoach lesson is over, go back and review what you learned. Your captured video’s with corresponding white boarding are available for review anytime. David and the staff at Mobicoach were kind enough to offer GMSL nation a promo code to receive 15 free minutes of golf instruction. Head over to www.Mobicoach.com and use code FREE15. If you take a lesson, look for me in the stable instructors. Whoever you choose, let us know what you thought the online lesson process. Check our review on the SwingTIP here.